While waiting for the delivery of a purchased item, your customers would like to track stages of shipment and delivery process. This extension perfectly meets this goal offering a client to get detailed shipment info. Customers can check order status by entering order number and email or phone. Admin can enter UPS, USPS and FedEx tracking codes while marking order as shipped. UPS, FedEx and USPS tracking is meant to make order tracking fast and easy. This is a free extension allowing your site’s customers to observe the shipment’s progress by a tracking number within your Magento store and showing every single detail concerning the order’s delivery. It is an easy-to-use plugin that is going to boost customer loyalty and increase confidence in your online business. I have tried a lot of tracking plugins for Magento 1.9. Finally, I got this extension and installed the same. The installation is very simple which automatically creates a page with the URL ends with "shippingtracking" and customers can access this link from the website. I have included this link in order processing email which helps customers to track their order. Also, I see that this extension reduces a lot of shipment related queries from the customers. Because customers find the tracking information and order status from the website itself which is very helpful. I operate a site that sells downloadable products that the customer can also choose to have shipped to them if they wish. I was hoping that this extension would work with all Magento product types but unfortunately it does not work with downloadable products. Magento itself does not allow you to ship downloadable products. Our extension only uses native Magento functionality to display order status and shipping tracking. The correct way to enable shipping for downloadable products is to create configurable product consisting of downloadable and simple products (where simple product is your physical DVD or Gift Card). In that case standart Magento shipping functionality would work and our extension would display order status and shipment tracking. Hope this helps! This is the best free component that does a lot. Is easy to install and overall the setup can be done in couple of minutes. I use this in 3 websites and works perfect. Though I got this for free but helped us resolving logistics & courier integration & making the process a lot simpler. It helped our Backed teal Set proper tracking & helped customers with better tracking info. I Really like this extention. It provides the best service of tracking order. And I really appreciate the service and customer support. Thanks for launching this type of product. it gives you the option of tracking order status by order and email as well as tracking the package as a frame in my branded site. Extension works well in CE version 1.9.0.1. You'll love it. This has helped decrease our Email Order Status Queries down by atleast 8-9% . Works out of the box. We have customized the code a bit to suit our CSS needs of the website. I purchased several extensions from Plumrocket, this being one of them. Rather than give clients the tracking number and nothing more, now I have the opportunity to get them back to the store when they track their shipment. This extension is good for customers to see their shipment progress. Some guests buy, but don't want to register for an account. So, this extension helps us give our guests more visibility over their order/shipment progress. Good user guide which makes configuration easy. Plumrocket installed and worked out all bugs. I highly recommend their extensions and services. 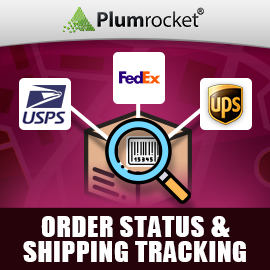 This Order Status & Shipping Tracking Magento Extension is great for my customers! Customers like to know about their products status and to track their order and so I was happy to get this extension for free and buy the Estimated Delivery Date Magento Extension to go with it. So I recommend getting this extension and buying the Estimated Delivery Date Magento Extension to go with it. Extension fits perfect in to our site, thus customers greatly benefit from built-in display of their orders statuses. Thanks for this great, and most importantly - free product! I read the reviews before buying this product. Excellent extension, worked for me problem-free as advertised. I love it! This extension fulfilled my requirements. You guys rock! I install and test Plumrocket Order status and Shipping tracking in Magento 1.9.2 . Extension works perfect and customers can tracking order status by order and email. Easily allows customers even if not logged to track orders. Very quick install and very useful. I Love this extension, it gives you the option of tracking order status by order and email as well as tracking the package as a frame in my branded site, and to me the more the client is on my site, the more opportunities I have to sell to them. A cute addon to share order tracking with your customers without any effort. Try this and you will not regret. Using this module is more convenient than to deal with shipping companies (meaning, with checking at their sites all the time). You just configure the extension according to developer's wiki, and just use it. My loyal customers have already sent kind words of appreciation. So yes, I do recommend this piece. Customers love when you make things easy for them. This extension does just that by allowing customers without having to login track their order shipment and also print it out in case they want to.